Winthrop, WA is one of the coolest places in the world. It doesn’t mean to be, but it is. 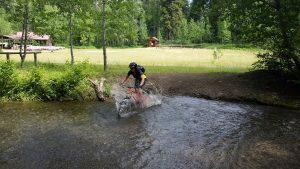 We’ve had some amazing adventures there in recent times, and this summer we went back for an outing that was defined by some amazing biking. 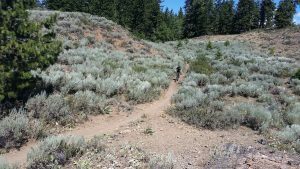 We started out on the Sun Mountain trails, where I cheerfully rode over a small rise into the creek that was just a trickle last time we were there in September, only to find that summer conditions are a bit different. Next up was Buck Mountain, a circuit that’s been on my wishlist for a long time. It lived up to all of my expectations, and then some. 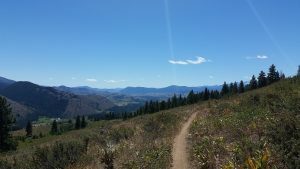 This was truly the route of singletrack dreams. There’s something in me that’s always been entranced by the sand and sagebrush, the big high skies that only open up over arid landscapes. Buck Mountain provided all of that in spades. A long, long climb brought us to miles of laughing, dusty, perfect descent: narrow, winding singletrack, brakes barely required, sand beneath the wheels, a few little stumps and bumps to hop off here and there. Beneath scorching blue skies, it felt like some kind of biking heaven and I never, ever wanted it to stop. Of course it eventually did, and we climbed back into the car and took ourselves home for a dusty, tired soak in the hot tub at the River’s Edge Resort (highly recommended). 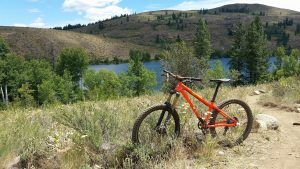 There was still time, on our last day, to take the bike back out to the Patterson Lake trails for a final rip in the sunshine. Winthrop, I’ll miss you. 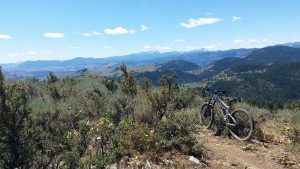 This entry was posted in Biking on July 4, 2016 by Kay.